I posted a new photo to Photos. thanks to maryo for sharing this one with me! 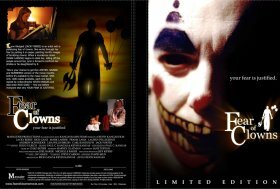 Looks like the folks over at Cool Site of the Day picked ihateclowns.com as today's Cool Site. So I was walking around Los Santos in the new Grand Theft Auto San Andreas game by Sony and I come across this ice cream truck with the dubious name “Mr. Whoopee” printed on the side. The top of the ice cream truck is adorned with this phallic depiction of an ice cream cone sticking out between 2 round scoops of whip cream. I decide to investigate this purveyor of ice cream a little more deeply and who do I find as the driver of the vehicle? A creepy, sneering clown! Is this who you really want selling ice cream to your fictional, video game created kids? Does the video game world have NO values? I quickly gave this video game clown “what for” and went about my business of being a good citizen of Los Santos.